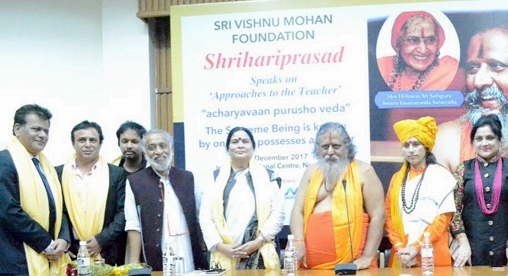 Sri Vishnu Mohan foundation organised a spiritual event based on Approaches to the Teacher, Acharyavaan Purusho Veda. This event held in India International Centre, where many prominent celebrities like Dilip Cherian, Sadhvi Purvi sakshi ji. Reality TV star. Sanjay Harry kapoor.. Bollywood singer Sameer. .Anu Dheer.. Ex Minister. Sandhya bajaj..and many more media personalities & hundreds of followers were present.. In the welcome address Guru ji ..says that Teaching & World Peace is the need of the Hour.